So you have managed to successfully install and terminate cables, its now time for testing fiber optics. For every fiber optic cable plant you will be required to perform tests that touch on continuity, trouble shooting as well as end-to-end loss, after that you will be required to troubleshoot the problems. In this article I am going to show you how testing fiber optic with an OTDR works. Whether or not you are seasoned pro or a newbie installer the following should be remembered when it comes to testing fiber optic with an OTDR. Have a good Knowledge and understanding of the network that you are testing. 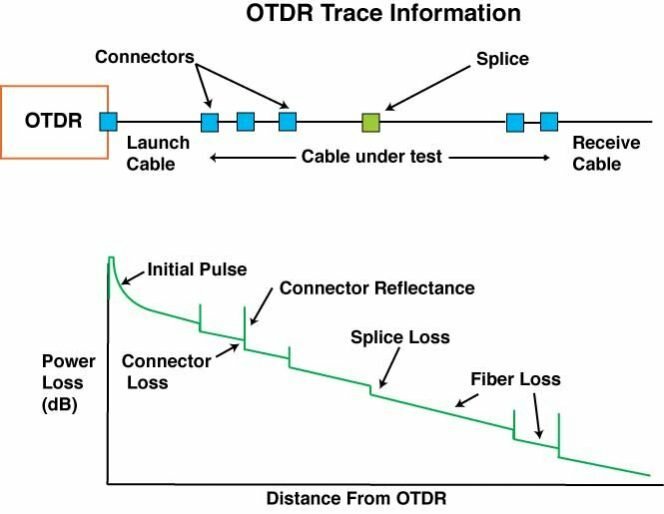 It’s good to start by indicating that when it comes to verifying the loss of each splice OTDRs are usually used on OSP cables, with that out of the way let’s look at how OTDR can be used in testing fiber optic. Unlike other testing methods such as light sources and power meters which tend to measure directly the loss which is evident on a fiber optic cable plant, OTDRs works indirectly. The power meter and source usually duplicates the receiver as well as the transmitter of the fiber optic transmission link, this enables the measurements to well correlate with the loss of the actual system. On the other hand when it comes to implying loss OTDRs uses backscattered light of fiber . Just like the RADAR, OTDRs sends a high power pulse of laser light down the fiber and look for return signals from light which is scattered in the fiber or light which has been reflected from the splice interfaces or connectors. The light seen by OTDR’s when testing fiber optic is usually light which has been scattered from the pulse which is passing through a region of the fiber . The amount of light which gets scattered back towards OTDR is usually small. That said it’s possible for measurements over distances which are relatively long to be taken given that you have sensitive receivers as well as signal averaging. Thanks to its ability to calibrate the pulse speed as it passes down a fiber , OTDR is able to calculate the pulse position and correlate the backscattered light that it sees with an actual location on the fiber as well as measure the time. This attribute makes it possible for OTDRs to create a display of the amount of light which is back scattered at any given point in the fiber. Given the fact that the pulse is attenuated when passing along the fiber and the fact that it suffers splices and connectors loss, there is a decrease in the amount of power which is in the test pulse as it passes along the fiber in the cable plant which is under test. Therefore there is a considerable reduction on the portion of the light which has been backscattered, producing a picture which highlights the actual loss that is currently in the fiber. In order to convert this information into a display you will be required to perform various calculations this is due to the fact that this process usually occurs twice, that is once on the return path from the scattering which is present at the at the test pulse and once going out from the OTDR. In situations where by you would want to measure fiber attenuation, you will be required to use a fiber which is fairly long in length, the fiber is also not to have any distortions on either end from the OTDR overloading or even resolution as a result of large reflections. The OTDR display offers a lot of information. Attenuation coefficient of the fiber is usually shown on the slope of the fiber trace the attenuation coefficient is then calibrated by the OTDR to dB/km. In OTDR jargon the term events is usually used when referring to splices and connectors. In OTDR both the splice and the connectors should indicate a loss that said it’s good to note that mechanical splices and connectors will indicate a reflective peak so as to ensure that you are able to distinguish the two from fusion splicing. Problems which might arise in the cable during the installation process can also be detected by OTDR. In a situation where a fiber gets broken, it will show up as the end of the fiber much shorter than the cable or it can as well as show up a high loss splice at the wrong location. In an event where excessive stress is applied on the cable as a result of a bend radius being too tight or even as a result of kinking, it will look like a splice which is at the wrong end. One of the major limitations that is evident with OTDRs is limited resolution distance, this usually makes it really hard to use especially in a building environment or LAN that has cables which are a few hundred meters long. A user is bound to be confused more often than not when using OTDRs in LAN areas or building environments with short cables given that the process of resolving features is very difficult with short cables. There are a few cautions which one can take up so as to make testing fiber optic with an OTDR much easier as well as more understandable, this can be achieved by ensuring that you use a long launch cable. By using a long launch cable you will be allowing the OTDR to settle down after the initial pulse, it also provides a reference cable when it comes to testing the first connector on the cable. You should also ensure that you begin with OTDR being set for a shorter pulse width as this will facilitate for best resolution, you also ensure that the OTDR is started at a range which is at least two times of the length of the cable that you intend to test.